Have you ever driven to the course wondering what kind of golf swing you will have for your match today? Or had a great practice session on the range, only to find you left that great golf swing at the range? Perhaps you own many golf books, have purchased all the latest golf instruction DVD’s, taken golf lessons from PGA pro’s, attended expensive golf schools and clinics, and still haven’t improved. Maybe you’ve bought new golf clubs looking for help. What you need is The Blueprint. Stop wondering about your golf swing, and get a golf instruction book that really works. For less than the cost of typical golf lesson from a PGA pro, you can own a golf instruction book that teaches you sound fundamentals and how you can memorize the golf swing so that you will never forget it. What makes this “book” a must have? More than just another golf book. It is a complete golf instruction program! Each full subscription comes with our exclusive video check point service. We not only show you what to do, we provide video analysis as you move through the book’s training, guaranteeing you are PRACTICING CORRECTLY. You get 12 submissions /reviews! This service alone is worth the “price of admission”. It’s like having a YOUR OWN GOLF PROFESSIONAL right there at your PC! Works with any type of golf swing - Stack & Tilt, Simple Swing, Trahan, Graves, Hardy, Moe Norman, Natural Golf...because you focus on the Absolutes, you will just make your preferred golf swing style stronger and better. 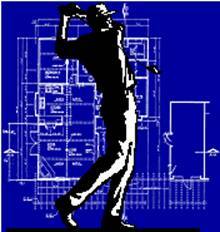 No need to change your golf swing...just fortify it with The Blueprint’s Absolutes. Learn to play golf on automatic using the automatic principle. It ‘s guaranteed ....complete the program with no improvement it’s your money back. 200 + color still photos! The transition is one of the most difficult things to master. Still, if you get it even a little, it will change your golf swing forever. To pay by check or money order, mail to PO Box Below, send email. You will receive your download instructions within 24 hours of receipt of payment. A Golf Instruction Book Like No Other – It Works! Imagine that! The Blueprint is based on a series of isotonic and isometric exercises that progressively allow the golfer to literally build the golf swing from the ground up. Similar to that developed decades ago by legendary PGA instructor Paul Bertholy, and a mental approach developed by Clearkey Golf, students perform a series of golf swing conditioning exercises that progressively enable them to memorize and imprint the moves and positions common to all great golf swings. The process is supercharged as students learn how to turn off the conscious mind and engage the subconscious. This allows students to experience a level of learning and playing far beyond that which is currently available in the golf instruction industry. The student literally will learn to play golf without thinking about his golf swing! 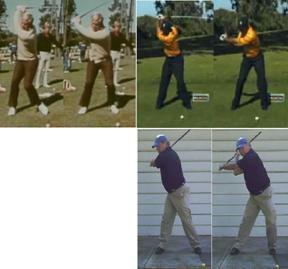 At the right are screen shots I captured from YouTube videos of two golfers you “may recognize”, taken decades apart, stopped at key times during their swings. You could swap in ANY tour pro from the last 50 years and they would look the same at these same points in their swing. To have a great golf swing All golfers must master certain moves - The Absolutes. The guy with the blue cap is me performing the first exercise in “The Blueprint” using a split hand grip, and a heavy weighted pipe. I am performing the same moves that the world’s best golfers do, practicing them over and over in slow motion until they are perfected. Much like the Kata of the martial artist - the student proceeds with a deliberate and steady pace until the golf swing seeps into the golfer’s being at the very deepest level—the subconscious. There it remains as a fully built and functional golf swing habit that once learned the golfer never forgets. The last, best golf instruction book you’ll ever need - guaranteed.